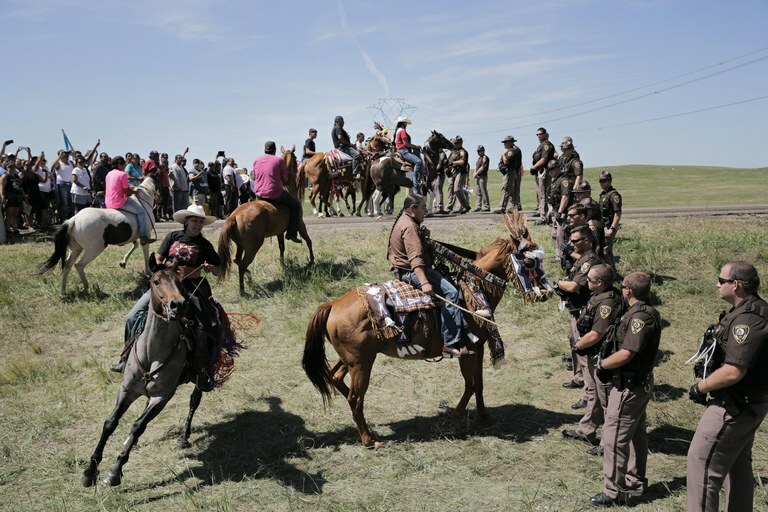 Riders from the Standing Rock, Rosebud and Lower Brule Lakota reservations came together on horseback in August to face off with a police line that had formed between protesters and the entrance to the Dakota Access Pipeline construction site. With those words, he had captured the quiet war underway on the plains of North Dakota. It was an unannounced battle, waged by some of the men who had traveled to the camp — warriors — publicly and within the spirit, as they confronted the legacy of the American frontier battles and genocides that had cast the mold of the American man and charted the course of the nation. The most evident sign of such battles occurred two days earlier, on Dec. 5, when Wes Clark Jr. and a dozen other veterans announced themselves as the “conscience of the nation” before a group of Sioux spiritual leaders. Clark, the son and namesake of U.S. Army Gen. Wesley Clark, the former supreme allied commander of NATO, had donned a hat and jacket, deep blue with gold braid, the uniform of George Custer’s 7th Cavalry, which fought the Sioux in the 19th century. On bended knee, Clark removed his hat and bowed his head before Leonard Crow Dog, a Lakota medicine man. And then he begged for forgiveness for the atrocities committed by the U.S. military and the nation, for the theft of Native American land and children, the desecration of sacred sites and the destruction of Native American languages. The forgiveness ceremony seemed fitting within the massive and historic opposition to the Dakota Access Pipeline, which had been rerouted from the mostly white city of Bismarck, and now threatened the water source and sacred sites of the Standing Rock Sioux. With the pipeline project, American Indian tribes and their supporters reckon with forces much like those that were behind the creation of the modern American West — banks, corporations, the government and troops representing their interests — working in concert to extract and exploit in the name of prosperity. With those forces came cultural messages about men in the West, messages that seemingly confronted Sonny Ironclad, a 25-year-old member of the Standing Rock Sioux, when he and other young Native American men on horseback rode from camp to a nearby bridge, the front line, where law enforcement constructed a barricade. The police become visibly nervous, he told me. “They think we’re dangerous; we’re just on horses. We don’t have weapons. They have weapons.” Ironclad stroked his mare and chuckled. In the Western myth, men conquer and exploit. At Standing Rock, men spoke of finding family. “Everybody treated us differently off the reservation,” Ironclad said, greeting new friends walking by. The camp had drawn representatives of 300 American Indian tribes. It had grown with the arrival of whites, African-Americans, Latinos and Asian Americans. “I have found another part of my family I have never known,” he said. In the spirit of a Lakota tradition of Hunka, he embraced tribal members from all over the world as family. And, he said, after his former co-worker, a white man, visited him at the camp, he was no longer just a best friend, he was a brother. At daybreak, as the sky turned silvery blue, men found a place of prayer in the water ceremony celebrated by women. At the ceremonial fire in the center of camp, women distributed water in small cups, tiny reminders of material life. The crowd then moved through the camp and down to the snow-covered banks of the Cannonball River. We pinched off some tobacco and, one by one, approached the iced-over river with our offerings. Before us, standing shoulder to shoulder, the men lined the rocky, icy stairs, each with his hands outstretched, giving of himself as support, as part of the prayer. The men asked for nothing, not gratitude or even acknowledgment. Some said, “Good morning.” Later, I overheard a man express wonder and joy at supporting women simply by being present. It was not their physical strength that was valued, or their help, but their presence — an act of giving by being. From the river, I climbed the snowy bank, returning to the camp to the sound of “The Star-Spangled Banner” played on a bugle. With Standing Rock comes a response and another chapter to the 19th century formation of the nation, when the “Indian wars” became symbolic of the United States’ greatness, morally and economically, and of a promised future. In The Fatal Environment: The Myth of the Frontier in the Age of Industrialization, Richard Slotkin writes that Custer’s march into the Great Plains was saddled with the pressing political and social needs of the time. Custer’s “triumph over the savages of the plains would not only end the Indian wars, it would point a stern lesson to the other forces within the Metropolis — disorderly ‘tramps,’ immigrant laborers, recalcitrant blacks about the will and capacity of the republic to punish its enemies and vindicate its moral and political authority.” Custer’s defeat, however, did nothing to diminish the nation’s intent to impose order on the unruly and marginalized. Standing Rock summoned warriors who detected that legacy in law enforcement’s use of water cannons and attack dogs. “The way they were treating people was horrible,” said 33-year-old Issac Segura, as he gazed from a snowy embankment not far from where the clashes took place. Segura and his friend, Eric Flores, battle brothers from Iraq, had watched the videos of the clashes back in Chicago; both men called the images tragic. Flores organized a team and rounded up supplies, and the men set off for Standing Rock. “And who are you?” I retorted. “Someone who brought his own,” the man said, as he walked away with someone else’s tea. In him, I observed his forefathers, men who built their fortunes by seizing the riches of others. But through prayer and speaking with elders, he said, he had learned that “it is the true warrior that’s within us that’s starting to come out.” His warrior life is now spiritual, blessed. 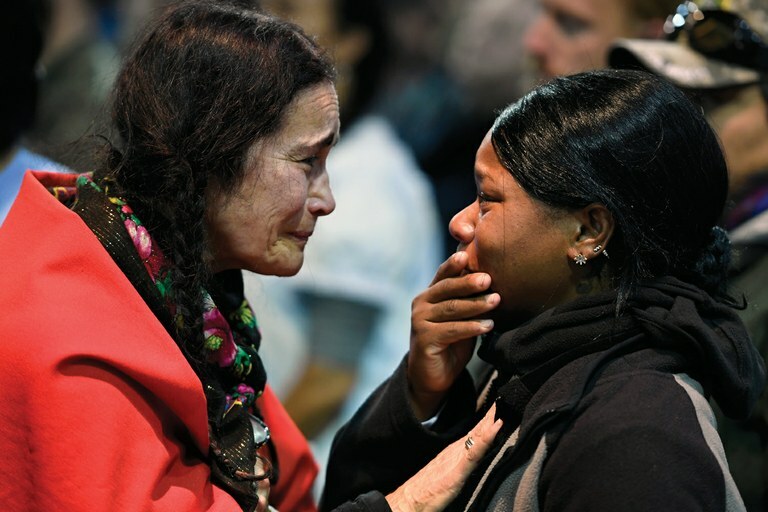 Maria Michael, a Lakota elder from San Francisco, left, talks with U.S. Army veteran Tatiana McLee, right, during a forgiveness ceremony at the Prairie Knights Casino and Resort on the Standing Rock Sioux Reservation in December. The ceremony was held to give veterans an opportunity to atone for centuries of military actions conducted against Native Americans. In Standing Rock, I confronted the split image of the world I knew and the one I was taught. In the images of unarmed Sioux men on horseback riding up to the front line, I was reminded of men I have loved and respected, men who measure their worth by serving their communities and families. In them, the warrior becomes life-giver. But in the United States, there is no escaping a shared frontier mythology that brands non-white men as natural-born threats. And that message is embedded in the genetic code of this nation.